Practical and fashionable, our collection of custom smooth vertical blinds are the most versatile of all window treatments. Paired with a contemporary valance, you have an ideal window covering for any room in your home. 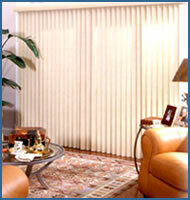 Easily maintained, with excellent light control, you can enjoy our Smooth Vertical Blinds at a Discount. And unlike other vertical blinds at a discount, our headrail system incorporates self lubricating wheeled carriers to give you years of smooth operation, and louvers that will stay in alignment. All 3 1/2" Smooth Economy Vertical Blinds are custom made to your specifications and typically ship 3 to 5 business days after ordering. Minimum depth for inside mount is 2 1/4"
Available with left or right stack free of charge. Chain & Cord or Wand Tilter Contols.